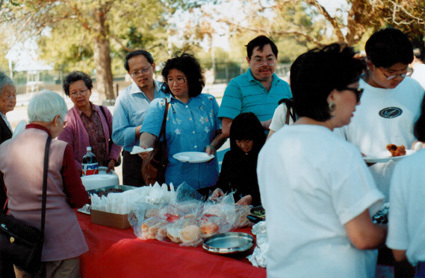 Our Chinese New Year’s Celebration started with a noon gathering at the Family Association on March 05, 2000. We were also honored with the presence of Mr. Jack Y.Yee, Western Regional Grand President and his wife. Mr. Steven Yee was the master of ceremony. At noon, we had our Ceremonial tribute to our ancestors by the family members. Afterwards we enjoyed a Buffet Luncheon. 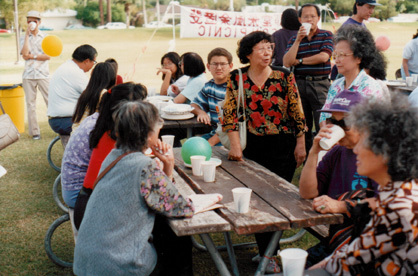 The YFT Woman’s Auxiliary provided the Dim Sum. There were approximately 150 people attending this event. Mr. and Mrs. Jack Y. Yee provided the Roast Suckling Pig for the luncheon. 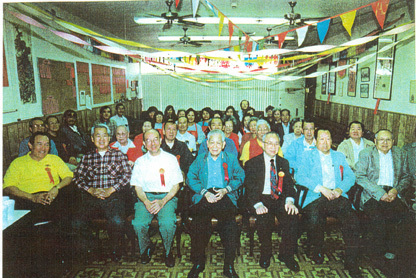 The banquet was held at the Great Wall Restaurant with Mr. Ched Yu as the MC. There were approximately 400 guests in attendance. We had representatives from San Francisco, Flagstaff and Eloy. President Willie Yee presented the “Welcoming” address. Mrs. Buddy Hing announced the Scholastic Awards. The Scholarships were presented to the graduating grade school students as well as high school graduates. Vice-President Edward Yee presented the “Closing” speech. 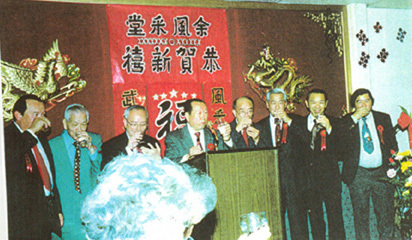 In the photo from left to right: Edward Yue, Ben Wong, Jack Y. Yee, John M. Yee, Willie Yee, Jerry Hom, Herbert Kong, and Guy Lee. 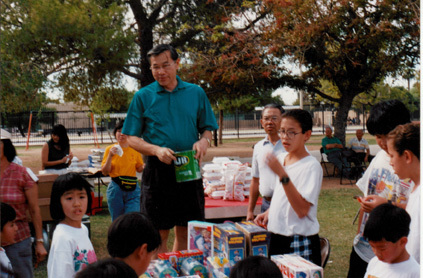 On April 30, 2000, the Phoenix YFT chapter celebrated its 11th year of the opening of our family center. All family members, young and old were invited, which brought the attendance to approximately 150. Mr. Tim Yee was MC for the event. 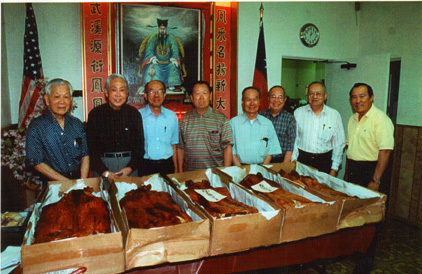 Mr. John M. Yee and Mr. David M. Yee each donated a pig for the celebration. The food was prepared by David Kwan’s Restaurant. 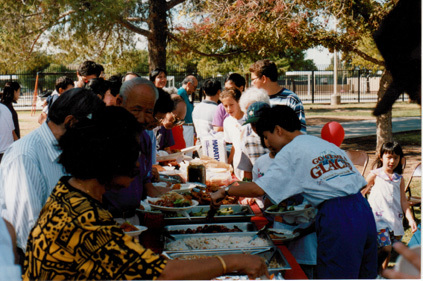 The guests were served a buffet lunch for the event and each family was given a serving of “Suckling Pig” and if “over 65”, you received a “double-serving” to take home. 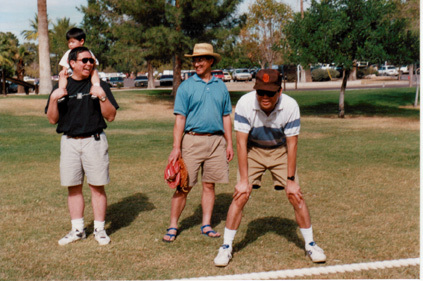 In the photo from left to right: Ben Wong, Raymond Yu, Willie Yee, John M. Yee, Bill Yee, Raymond Yee, Jack N. Yee, and Ed Yue. 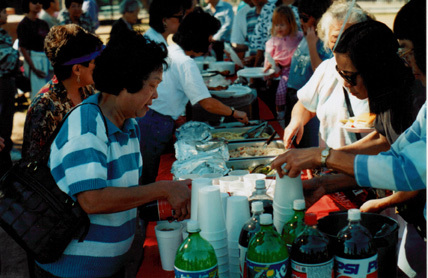 Every year at this time when the summer heat subsides and temperatures drop to the 70’s, our thoughts “clamor” for hotdogs, hamburgers and Chinese food along with dust and flies of a healthy picnic. 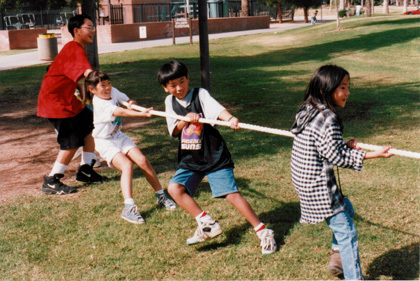 So, on October 31, 1999, two “designated” fools awake at 4:00 a.m. and proceed to the park and “stake-out” a site so that the other 198 members and friends can assemble at 12:30 p.m. to partake in fellowship, food, and a good time. We had over 200 people attending with 4 of them, over 80 years of age. We finish the picnic with a drawing. The children have their drawing with gifts of toys, and the adults get gifts consisting of food and household items. Turkeys and hams were the top food prizes. This year Mr. John M.Yee and the Phoenix YFT donated $500.00 to the Taiwan Earthquake Fund.